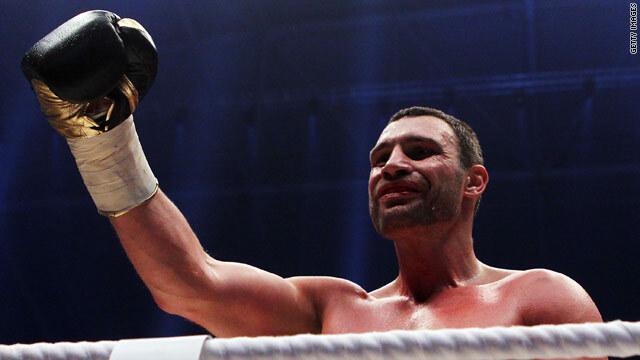 Vitali Klitschko acknowledges the crowd in Gelsenkirchen after his 10th round victory. (CNN) -- Vitali Klitschko retained his WBC world heavyweight boxing crown with a 10th round stoppage of Polish challenger Albert Sosnowski in Germany. The 38-year-old Ukrainian was making the fourth defense of this version of the world title, but was made to work hard by the spirited Sosnowski, who is based in England. He finally caught up with him in the 10th as a big right opened up a cut above the hopeful's right eye and sent him to the canvas with 29 seconds left in the round. Klitschko, whose younger brother Wladimir holds the IBF and WBO heavyweight titles, said his next opponent was likely to be Britain's WBA champion David Haye or former champion Ruslan Chagaev. Haye beat the giant Chagaev to take his title last year and a match-up against one of the Klitschko brothers is set to be a big box office draw. Vitali's fight against European champion Sosnowski drew a good crowd to the Veltins Arena, home of Bundesliga football side Schalke 04, with both the Klitschkos popular in Germany. He was happy to have seen off a difficult opponent. "I was in good form, Sosnowski was younger than me, but people saw that I did well against him," Klitschko told gathered reporters. Sosnowski is hoping that youth is on his side as he looks to win a global title. "I am a bit disappointed, because I thought I had a good chance of winning this fight," he said. Klitschko was content to go through the gears against the shorter Pole, who had some success in the fifth and sixth rounds. But in the ninth, Klitschko took command as he pinned him to the ropes with a flurry of punches, only the bell saving the challenger. The end was not long coming as Sosnowski looked a beaten man as he came out for the 10th and so it proved. It was the 40th win of Klitschko's career, the 38th by knockout.